So, its now April apparently and it very much seems like March was one of those months that disappeared faster than a horse running at the national. The months seem to fly now that the clocks have changed and even though it is incredible to be having some lighter evenings to relax outside, it just seems like time goes a little bit faster when your enjoying yourself in pub gardens and having barbeques at home. All the more reason to make the most of all this sunshine were currently having! The bank holiday was an absolute beauty weather wise and there certainly was no shortage of people taking their chance to have a pint by the canal at my local, the Fox and Anchor near Coven. 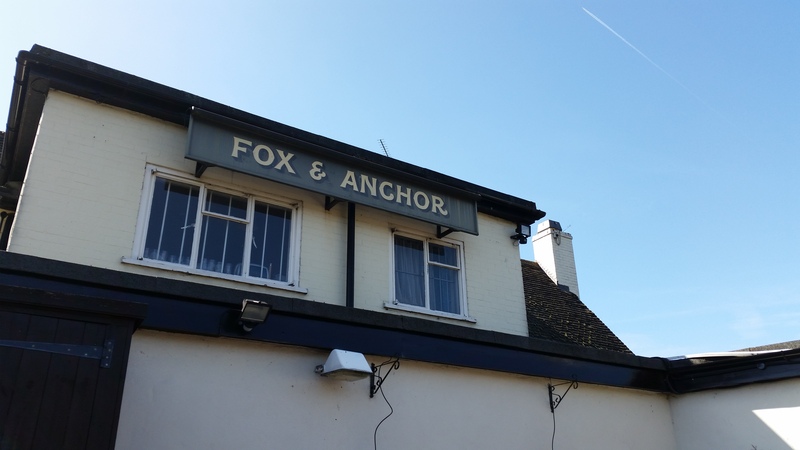 It is not very often I rave about a chain pub but I do love the Fox as it has a great ambiance in the winter when they light the log fires and even more so when they are buzzing with summer beer garden seekers. I even got a little bit sunburned. Which is not exactly hard as I burn like an ant under a blow torch. Now that we have all emerged from our wintery cocoons its time for some lighter food to compliment the bottles of Corona on the lawn (slice of lime optional but advised). 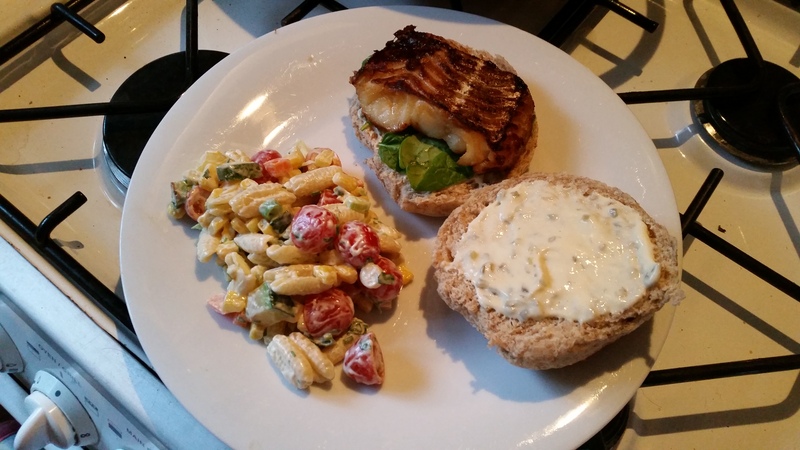 White fish comes to mind as its quick, fresh and light on the pallet while being full of protein and really satisfying, paired up with this pasta salad which is the true star of this dish,makes a great meal. Enhanced further by the fact that its full of all the good stuff you can fit in without it becoming unbalanced, you’ll be feeling very pleased with yourself afterwards. No guilt. No hastle. 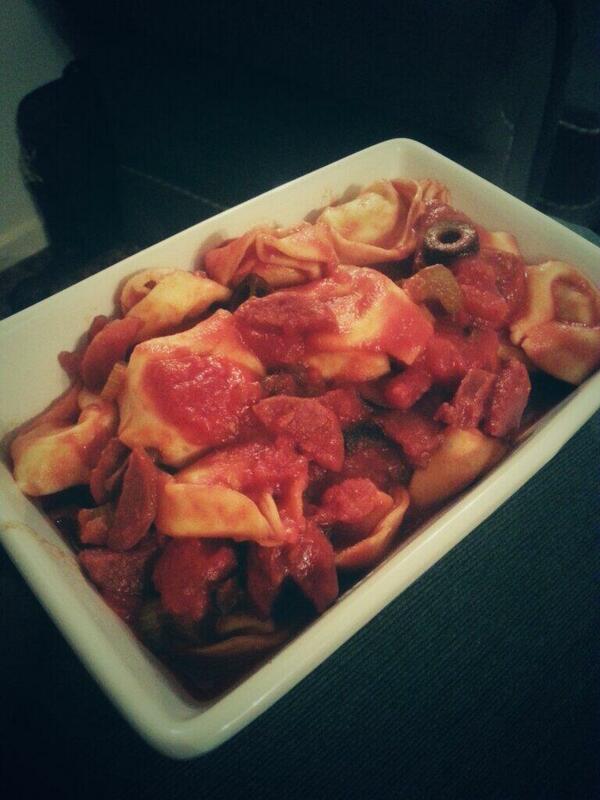 Try this recipe on for size next time your feeling lazy on one of these warmer evenings. 2 cod loins. Both halved. Few salad leaves of your choice. 1 small box of cherry or small variety of tomatoes, all halved. 1 red and 1 orange pepper, diced. 1 small can of sweetcorn. 3 spring onions, finely chopped. handful fresh parsley, finely chopped. 5 tablespoons of zero fat Greek yoghurt. Cook the pasta to pack instructions. 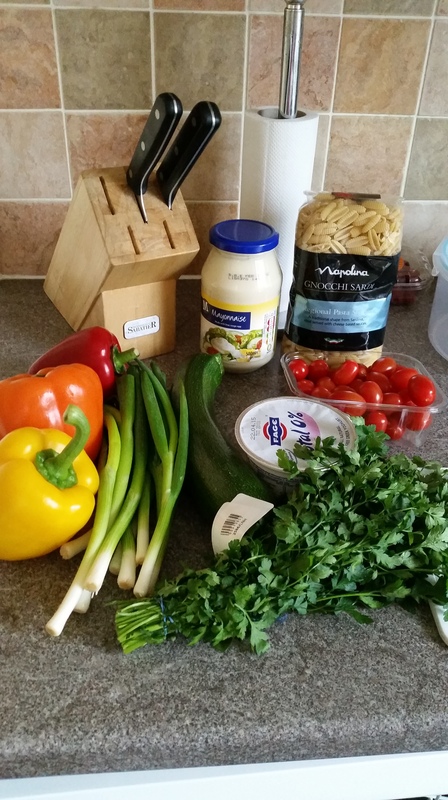 Add the pasta to a large mixing bowl and stir in all of the other ingredients apart from the courgette. Preheat a frying pan on a medium heat, add a tiny bit of oil and fry the courgette until it starts to brown a little, then remove and mix into the salad. Give a good few turns on a salt and pepper mill. Use the preheated pan and add a little more oil. Add the cod loin halves and fry on a medium heat for around 4 minutes. Turn over and repeat. Turn the heat up to high and add a tablespoon of soy sauce, give the pan a shake so it reaches all of the fish, do this for around 30 seconds and repeat on the other side. Cut the rolls and put around a teaspoon of tartar sauce on both halves. Lay a few leaves on the bottom half, followed by the soy fried fish, along with anything else you want to add. (Go crazy, its a blank canvas). Finish with one big sprinkle of black pepper, cap it off with the top half of the bread and serve with a big spoon full of the pasta. Its another very simple but very effective recipe to fill a void after a hard day at work when the evening is best spent enjoying the sunshine outside! I’ve always loved a bit of pasta. It can be an easy but satisfying option on a cold winters day or a bright summers evening, whether it be for a quick dinner for one or entertaining guests, you can impress with a good, homely bowl of fussili covered in an alluring, rosy red tomato sauce with some basil leaves and a grating of parmesan. It’s heaven. This recipe takes a basic tomato sauce and gives it a little bit of a spruce up to create something a little more warming and give you something to get your senses tingling with some great flavours and to give your insides a hug! The combination of the spicy, strong garlic punch of the chorizo and the sweetness of the wine elevate the tomatoes to another new level, providing the perfect accompaniment for a dish of pasta, gnocchi or even spread over meat or fish. I made it with some left over ingredients from the wild boar stew earlier this week. 200-300g pasta. I used some great little tortellini with spinach and ricotta. Boil the pasta in salted water to the pack instructions. Remove the pasta a minute or so before the instructed cooking time to maintain its al dente bite. Retain 1/4 a cup pasta cooking water. In a frying pan on a medium heat add the oil, celery and chorizo. Gently fry until the chorizo starts to go crispy. Pour in the wine and keep on the heat until it reduces by around half. Add the whole tin of tomatoes, garlic, salt and pepper to the pan and stir well. 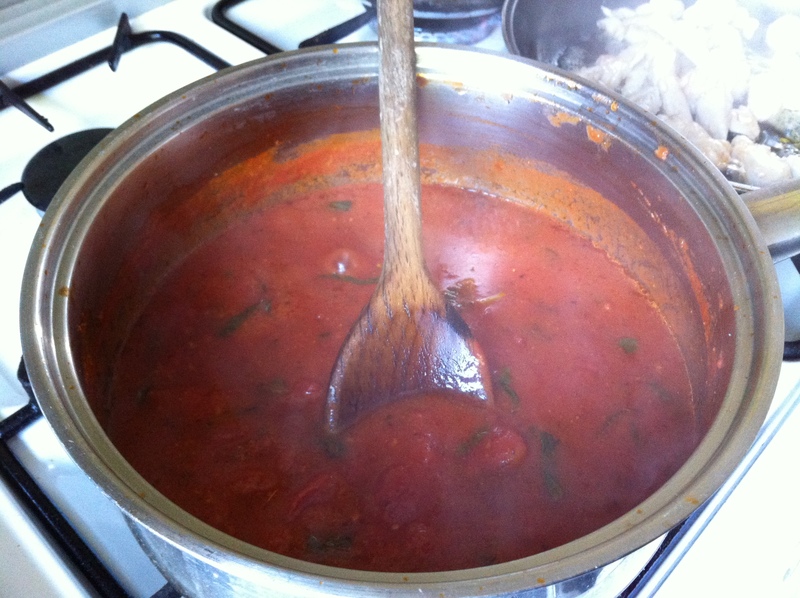 Still on the medium heat, cook for 4-5 minutes until the sauce emulsifies thoroughly, stirring regularly. Stir through the olives and add the butter, pasta and the reserved cooking water. Turn the heat up slightly and continue to stir the pasta into the sauce for a minute or so until the pasta is well glazed in the sauce. Serve and enjoy. Great for winter nights this one! This post marks the beginning of a series of 3 recipes in celebration of the Burger, be it lamb, beef, pork or chicken as long as it is tucked up nicely in a bun of your choosing with a few tasty accompaniments it can really make your day tucking into a wholesome, home made burger. 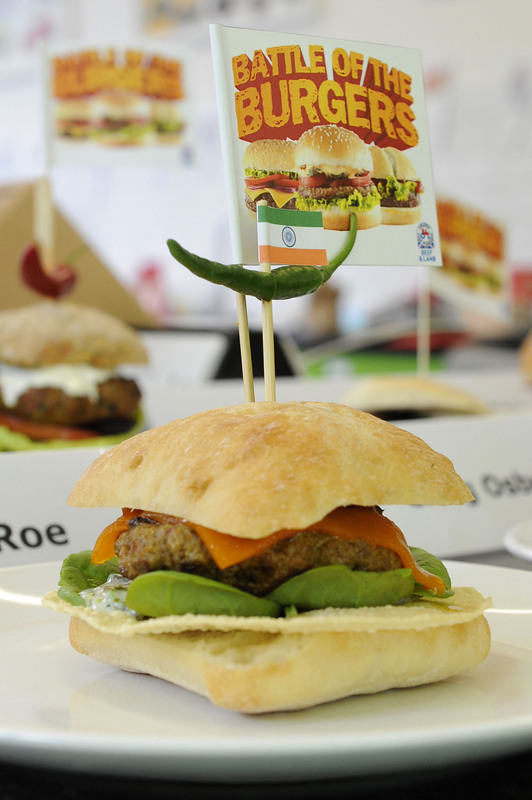 The reason for this trio of meaty creations is my truly amazing experience in September competing in the grand final of the battle of the burgers competition… What more would somebody need to inspire them to carry on making something than to do what you love with some really great people. The smells, the taste and the textures always get me exited when it comes to any food but nothing brings out my inner child like a big, juicy burger. My experience in London was bordering on life changing, I met some fantastic people and felt like I came away a better cook. I took my A game and I came away proud of how well I had done, now having cooked for JB Gill from the boy band JLS, also wasn’t too shabby to put on my culinary CV. I made two appearances on local radio, one of which was back to back with an interview with JB, so that was interesting to listen to! My 15 minutes of fame did not go to my head though I promise. So really quickly here is a picture of the final Bengal Burger, I was incredibly proud of it and will be back next year for sure to try and take the top prize. 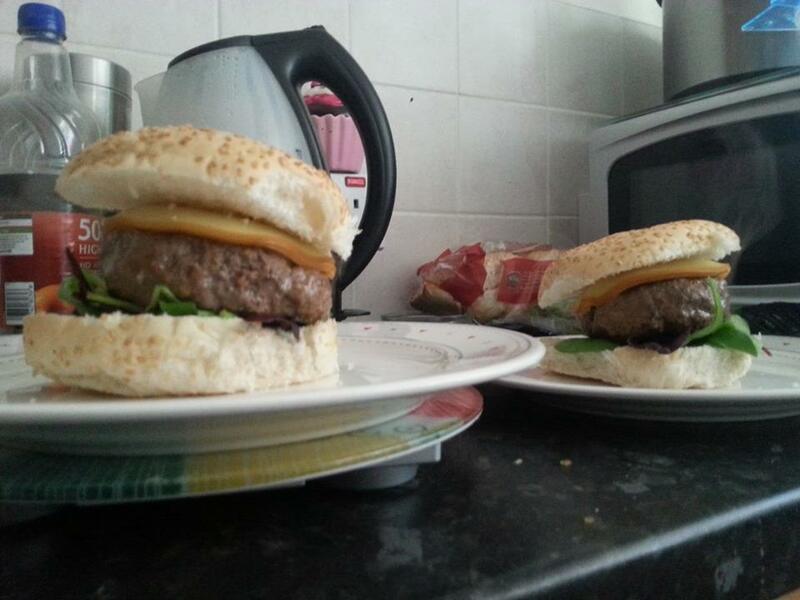 That brings us to the new recipe I have written for the first recipe of the burgathon. I call it the Mardi Gras burger and it is a tip of the hat to the bustling streets of New Orleans and the zingy kick of the Cajun and Creole styles of cooking that give southern America its soul and heart. 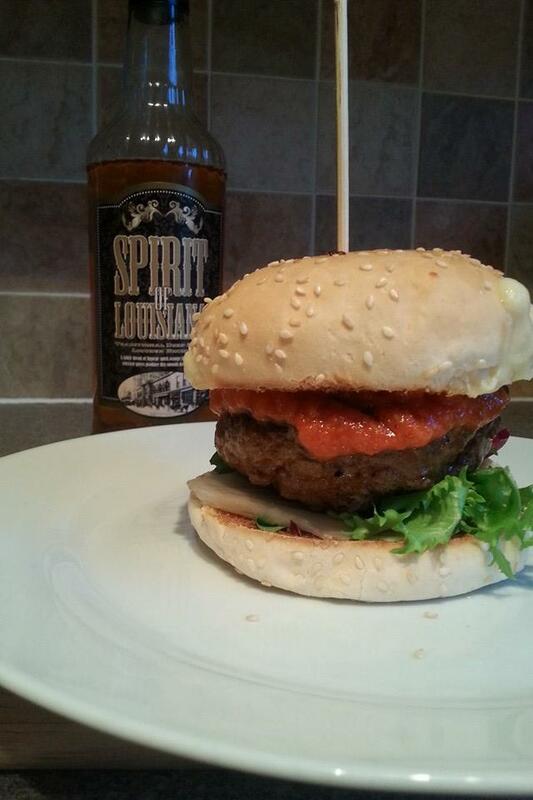 I have combined the warmth of Louisiana style liquor with the zap of tangy tomatoes to create a sauce that is the perfect blanket for the spiced up beef burger. I hope every bite takes you straight into bourbon street, the trombones and whistles ringing in the background of your mind while the Cayenne crackles away, warming your inner Cajun! 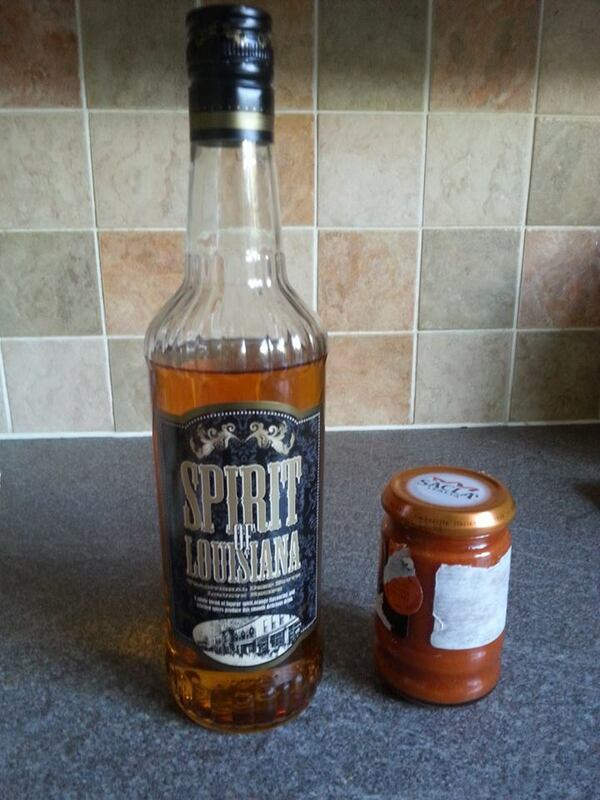 125ml Southern comfort/ Spirit of Louisiana liquor. 1 tin of chopped tomatoes. 1 heaped tbspn good tomato ketchup. 1 1/2 tbspn Cayenne pepper. 4 slices of smoked cheddar. 4 Good quality seeded buns. Handful of mixed salad leaves. Firstly you will want to get cracking with the sauce. Put the oil into a large frying pan and bring to a medium heat and spread the oil out evenly. Add the onions and garlic and cook until the garlic starts to soften and becomes fragrant. Add the Southern comfort and simmer for 5 minutes until it reduces to half its volume, cooking out the majority of the alcohol. Add the tomatoes, sugar, Worcester sauce, ketchup, salt and pepper. Cook on the medium heat for an additional 10 minutes, stirring regularly until the sauce thickens and the tomato juices reduce and begin to emulsify. Take off the heat and leave to cool, then drop the contents of the pan into a food processor and pulse a few times. This will give it a thicker consistency and thicken it up a little. Empty into a small container and put to one side to await its meaty vehicle. Before and after… Father and son. Combine the meat, cayenne, paprika, salt and pepper in a large bowl and mix well with clean hands. Split and roll into 4 evenly sized balls. Pat the balls down into approximately 2 cm thickness and lay on a plate, cover the plate with cling film. Refrigerate patties for 20 minutes. Preheat a griddle pan on a medium heat. Pre-heat your grill too. add a dash of oil to both sides of each burger and gently rub it in. Place 2 patties at a time on the griddle and cook for around 6-7 minutes on each side. At the end of the second sides cooking period, add the cheese to the top of the burger and leave to melt for a further 2 minutes. Take the Burgers off the heat and leave to rest in a warm place for 3 minutes. Cut the buns in half and grill each side until slightly browned. Add the mixed leaves to the bottom part of the bun, followed by the burger, top it with the sauce and cap it off with the top half of the bun. Now tuck into the zingy little beast and enjoy with your friends and family. This baby has real soul! !… Can anybody hear a brass band!? I look forward to next week as number #2 is certainly a porky little number! Hi all and welcome to the start of my personal mission. The aim of which is to convert people to a different way of thinking about what goes into their food. I am an adventurous eater and I take an enormous amount of enjoyment in trying new things, while taking even more joy in introducing other people to new things. This has led me to what I am writing about now, as not nearly enough people can really appreciate the kind of great produce our country has to offer if they are limiting themselves to what is available at the supermarket meat counter. This is not the consumers fault, but supermarket’s specialise in providing people with products they think sell well, which includes the usual cuts of beef, lamb, pork and a sprinkling of ‘acceptably fresh’ fish and I see it as a real shame that butchers are closing down all over our country because we are preferring the corporate convenience to the art of providing real, local produce in a butchers shop. The supermarket chains are forcing us to not have an option, due to killing off all of the independent businesses in local areas around their stores with mass produced (and sometimes low quality) meats. They mostly care about profit margins not quality of produce, the recent horse meat scandal is a good example. I have no issue with using supermarkets for things and I am certainly not saying they aren’t great ways to get a half decent range of foods and ingredients on your doorstep on short notice, especially when they are open 24 hours a day. My only gripe with it is they limit the opportunity to try new things because they have set products that they stock in every store, unlike your local butcher. who can give you what you ask for or maybe offer you something new, because they prepare it right in front of you with their vast knowledge of the animals they use. My granddad was a butcher for a number of years so I have an appreciation for the trade, a trade that is dying. This is why I am concerned, not because I am standing on my soap box and hopping on my high horse trying to feel superior to people because I like to try new things and they don’t, what I am saying however is that because we are becoming so detached from the process of the butchering of animals, it is changing the way we see our food. Nearly gone are the days you see the pig hanging from the hook in the window as you go in to buy the joint for your Sunday roast, now all you see is the rows of air tight packaging and labels. There is no connection to the fact it has been reared on a farm, cared for, put down and cut into that form by fantastic, skilled people. I believe this is slowly changing us into fussier eaters. Which is not a problem but it is a real shame. As I really don’t like the idea of people missing out on some truly great food just because it is not on the shelf at ASDA due to them deciding it’s not what you want. Ultimately, there are less options out there for us as consumers without the family butcher physically being able to offer you different options and sticking to what we know from the shelf. It’s for this reason certain animals and former staples in the UK are fading away and causing people to be desensitised to what actually goes on to produce what ends up on their plate. A perfect example is when I stated I was on the hunt for a few rabbits to experiment with and was met with absolute shock and awe by my friends. ‘That’s just wrong’ or ‘I couldn’t eat a rabbit its just plain sick’ and even ‘Your evil’ which really got to me, as I am not evil!. Less than 50 years ago it was possibly on par with chicken as one of the more commonly eaten meats in England. 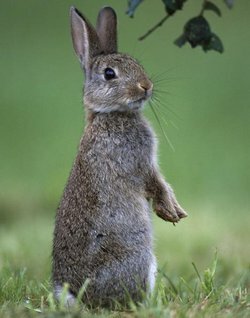 There are estimated to be over 40 million rabbits in the UK and getting your hands on one isn’t really hard, I got a whole jointed rabbit for £3.50 at my local butchers (Chandlers, Stafford road, Wolverhampton). The meat is darker than chicken, having much more depth in flavour and being more gamey. Although very similar to the untrained tongue, given to any unknowing chicken lover and I am pretty sure I’d get the thumbs up. If you haven’t tried it yet I would encourage you to give it a go at least once, and if you don’t like it, fair enough, But…. I love animals. I do. I have a pet dog and I’ve had many pets in the past so I can, in one sense understand that the picture above has a certain warmth to it. He’s cute, nobody can deny it. But he still tastes pretty great and in these times of apparent austerity people don’t have the money they used to, while still spending on expensive cuts of meat and overlooking perfectly good alternatives because they used to have of rabbit as a pet when they were 7. 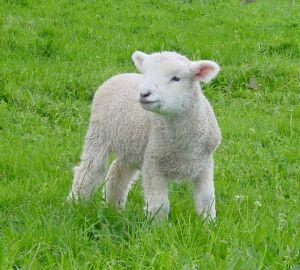 I just don’t understand the logic when people eat lamb, but say rabbit is too cute to eat. Its well worth a go, it really is. Rabbit is just one option too, there are a vast range of game birds out there that are less popular today that make great eating like Grouse, Pheasant, Partridge, Wood pigeon or my personal favourite niche bird, Guinea fowl. Your Lamb shank used to look like this! Something else that has been a point of discussion between me and a few friends is my willingness to get out there and physically find and hunt wild game, which was also met with mostly negative views of how I could kill something. I don’t have a problem with that view but it’s certainly how society has conditioned us to be. As I said above, we no longer look at a joint of gammon or pork and see a pig, we see its shiny plastic wrapping and the thick piece of fat that we all love and fight over when it’s roasted in its crunchy, golden glory. I believe knowing where your food has come from is a great way to get the best out of it in the kitchen, so this post is the beginning of my journey to do all the leg work so you don’t have to. So to start off, here’s my recipe for all the culinary braves out there willing to try to battle their preconceptions and try eating some really great wild rabbit! This is a brilliant but simple little recipe for you to enjoy with your family or to scoff all by yourself, with a changed attitude towards rabbit and genuinely bring a big food induced smile to your face. This can serve around 3-4 people. I served this with black pudding and really luscious mashed potato, which I do also cover below. Stewed wild rabbit. Using a slow cooker. 4 large rashers of un-smoked bacon, chopped into lardons. Add the rabbit to the pan and brown off evenly on all sides. You may want to do this in batches of 2 pieces at a time, then remove from the pan and put to one side. Add the bacon and garlic, cooking them in the rabbit enriched olive oil until the bacon starts to brown. Then remove the bacon. Turn the heat up to a medium-high heat and pour in the wine and 500ml of the stock, stirring well. This will bond all the lovely juices and fats that have escaped the meat with the liquid. Simmer for 5-6 minutes. lay the rabbit evenly in the bottom of the slow cooker, covering it with the remaining stock. Add the carrots, chopped celery, bacon, onion, big pinch of sea salt and black pepper. Followed by the reduced pan liquid. Give it a quick gentle stir without disturbing the underlying rabbit, pop the lid on and leave to cook for 4 hours. Around 40 minutes before the rabbit has finished its lazy 4 hours in its golden bath of yumminess, fill a large saucepan with water, add a pinch of salt and bring to the boil. Mash well with the butter, yoghurt, cream cheese and a pinch of salt and pepper to season. Pre heat your grill. Grill both sides of the black pudding until crisp and warmed through. Removed the rabbit from the stewed vegetables and stock and rest for a few minutes. Strip the meat from the bones with a fork. Be careful as there are some tricky little ones hiding in there. Serve the now shredded rabbit with a big ball of mash and a few pieces of black pudding. Finally, take a few cups of the liquid from the slow cooker and add to a pan on a medium-high heat and reduce for a few minutes until it thickens slightly. (I do cheat sometimes and add a heaped tablespoon of onion gravy granules to thicken it up and create something quite unique and a little more intense) Add a few spoons worth over the rabbit, and the potato. Finishing it off nicely. It truly is heavenly. I hope the recipe is to your liking and I will close with this, the only reason I have written this is because I care. I care about great food. I care about people making the most of what we have. I care about people not missing out on great produce and finally I care about great, skilled people being wasted and fading away. Don’t be scared, go to your local butcher or green grocer and buy something you wouldn’t usually buy and try something new. You might love it. As some may know this year I have entered the Simply beef and Lamb Battle of the burgers contest, pitting the countries most inventive home cooks against each other in a bid to find Britain’s best home cooked burger. And I have good news… I have been put through to the second round! And to advance any further I have to provide a comprehensive version of my recipe for the judges to mull over whether I’m worthy of a place in the final in London on September 6th, So naturally I’m sharing my recipe with you guys. 1 whole red chilli (Including seeds) Chopped. 2x medium to large tomatoes, Diced. Small handful of coriander, finely chopped. Large pinch mild chilli powder. 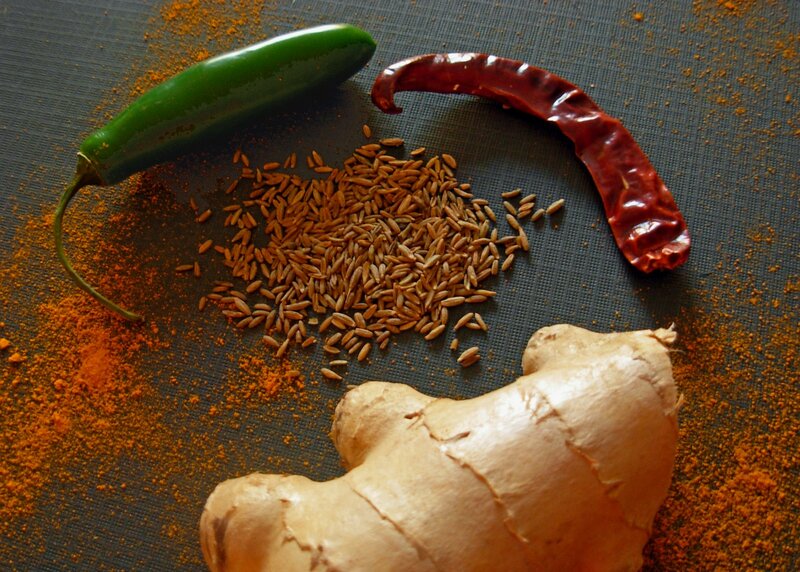 In a large bowl, combine the lamb with the paprika, chilli powder, garam masala, garlic, turmeric, and the cumin. With clean hands, mix well until the seasoning is evenly distributed through all of the meat. Once the meat is fully seasoned throughout, add the egg white and again, with clean hands mix well until the egg is well bonded with the lamb. tear off 4 evenly sized chunks of the mince and roll into balls. Pat the balls into a patty around 1.5cm thick. Relish- Add the tomatoes, chilli, coriander, salt, Olive oil and chilli powder and mix well. Mint dressing– In a small cup or dish add the yoghurt, mint sauce, pepper and the spring onion, mix the onions and mint sauce well until it is a lovely chunky consistency. By this time the burgers should have rested long enough, remove from the fridge and heat a griddle pan to a medium heat and add a little oil. Add the burger to the heated pan and cook for 5 minutes on each side, making sure its cooked through. Approximately 1 minute before you remove them from the pan add a piece of cheese to each burger. Prepare a freshly cut ciabatta roll, Lay a little of the mint relish on the bottom part of the bun, followed by a poppadum. Perch the cooked burger on top of the poppadum and add a spoonful of the relish, followed by another helping of the mint dressing. Cap it with the top half of the roll and enjoy! Anyway, I hope you like it and I really hope its enough to take me to London! Even if not I’m proud to get this far. Sometimes doing it yourself when it comes to sauces just doesn’t sound as attractive as buying it off the shelf, popping the lid off and dumping it in your pasta. Once you have tried this recipe I hope you will totally change your mind. Its very simple and that is the vital thing when it comes to this, simplicity. Trust me. This is enough for 1-2 people or 1 large pasta dish but feel free to double up, transfer it into a jar, store it in the fridge and use it when you need it. add the tomatoes, oil, garlic, salt and pepper and put onto a medium heat. Chop the basil roughly and when the sauce just starts to get to temperature add the basil and the oregano and simmer for 15 minutes. stirring every now and then. And your done. Within around 30 minutes. And you can keep that in your fridge and adapt it however you want, add chillies (my favourite) or anything you like…but this basis is fool proof!